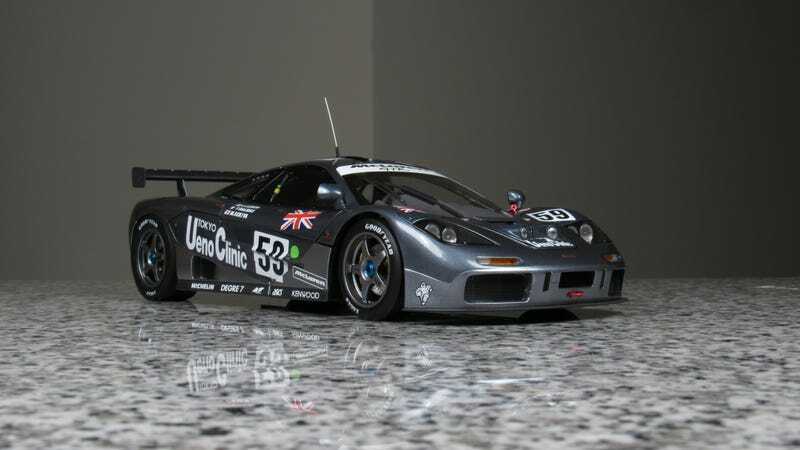 This is a 1/18 True Scale Miniatures McLaren F1 GTR. It is a replica of the overall winner of the 1995 24 Hours of Le Mans. Notable is the fact that this car defeated a field of prototypes, one of only two times a production based GT car has done so at Le Mans. The car was driven by Yannick Dalmas, Massanori Sekiya, and JJ Lehto. Also notable is that this win brought two new nationalities to the Le Mans winners’ circle, Japanese (Sekiya) and Finnish (Lehto). This model is absolutely superb. If you have been around LaLD for very long, you’ve seen it before. Several of us own one and we’ve all photographed them. But I would be remiss if I didn’t show it for LaLemans, so here it is again! I’m going to guess I won’t be the only person to post one. The details can be tough to photograph, especially with my point-and-shoot camera, but I tried to do a better job capturing them than I have in the past. Just look! The engine bay and interior are just insane. And exhaust and other mechanical components are fully fleshed out behind grills on the rear of the car as well.